GeographicalRange:The Gerenuk inhabits the woodland forest or the open and dry brushy plains of Somalia, Djibouti, Ethiopia, Eritrea, northern Kenya, and the United Republic of Tanzania. Diet in the Wild: The Gerenuk eats plants but no grass.They have a preference for leaves of bushes and trees, buds, shoots, fruit, and flowers.However, even though the Gerenuk inhabits dry area they do not need to drink much water since they absorb the moister the need form the plants they eat.Scientists have noticed that Gerenuks that are kept in captivity have never drunk water. 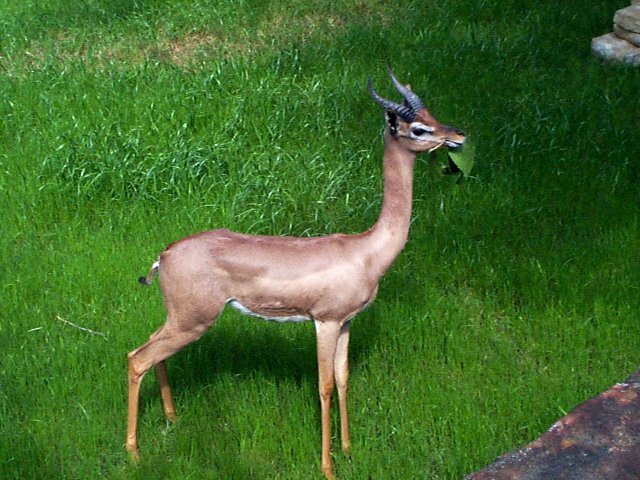 Conservation Status: The Gerenuk has been listened on the IUCN Red list of Threatened Species since 1996.The major threats for the Gerenuk are habitat loss, degradation of ongoing agriculture, harvesting and hunting.Their main predators are wild dogs, cheetahs, leopards, lions, hyena, and humans, which to decreasing population trend. Location in the Zoo: The Gerenuk is located at the African Hoof Stock Exhibit. The name Gerenuk means “giraffe-necked” in the Somali language.The Gerenuk is a creature with a long thin neck, and a small head in proportion to its body, but large, long and slender eyes and ears.There is a ring of white around the eye.The skinny body is supported by long, slender legs. The smooth coat is a reddish fawn, with the under parts and front of neck being white.Along the back is a dark band that reaches down the sides. However, its short tail is tipped with a tuft of black hair. Horns are found in males only, which are generally 32-44 cm long.The Gerenuk has a body length of 140-160 cm, a tail length of 25-35 cm, a shoulder height of 90-105 cm, and a weight of 35-52 kg. The Gerenuk is not a herd animal, and lives in small group of usually 2 to 12 animals.Occasionally, Gerenuks live in small groups of two to sic females, with a single male.It has been observed that sometimes a group of Gerenuks consists only of related females and their offspring.In other occasions, the group consisted of only males.The Gerenuk is active during the daytime.However, they often stand or lie in shaded areas during the heat of the midday. They spend much of their time feeding or searching of food. Scientists have noticed that the Gerenuks are quite different in some respects from other gazelles. Gerenuks may not dink at all during its lifetime.Many species of gazelle in the wild go for long periods without drinking, but they do drink water.To reach the leaves on taller trees the Gerenuk stands vertically on its hind legs, and balances so well that it can stand without any support.In times, the Gerenuk leans with its form legs against a tree or a branch. 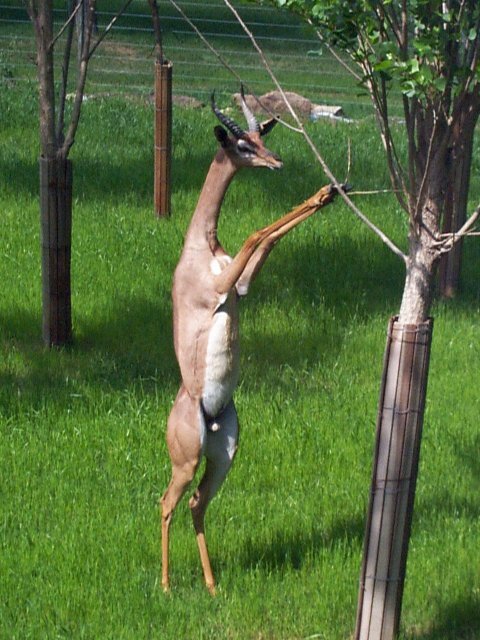 Then, it plucks the leaves from the branches with its long upper lip and tongue.The Gerenuk freezes and hides behind a bush, when it sees a strange object. Females reach sexual maturity at 1 year and males at 1.5 years. Females generally conceive every 8-9 month, and usually give birth to one baby per year, but sometimes a female will have 2 fawns in one year.The gestation period is 6.5 to 7 month.The female Gerenuk will give birth in a secluded place away form the others in her group.The baby spends the first couple weeks of its life lying in the bush while its mother is way feeding.A Gerenuks typical life span is between 10-12 years. During the mating ceremony, the male gerenuk marks his female with the preorbital glands at the shoulder region and the hindquarters.Consequently, the shape of the shoulder region of the female is no substitute for twigs or stems. I was very excited to finally see the Gerenuk in its life form. The Gerenuk at the zoo has a long thin neck, and a small head. It has long and elegant legs, and a smooth reddish fawm hair. I was able to see a single Gerenuk. The Gerenuk was identified to be a male because it had horns, and horns are found in males only. I was fascinated by the elegant appearance of the Gerenuk and its sharp senses. I was amazed by the fact that the Gerenuk became aware of my presence at the fence that surrounded him. I must say that I really enjoyed the trip to the Fort Worth Zoo. Grzimek, Bernhard. (2003)Grzimek’s Animal Life Enzycclopedia. New York. Van Nostrand Reinhold Company.pp.431-445.